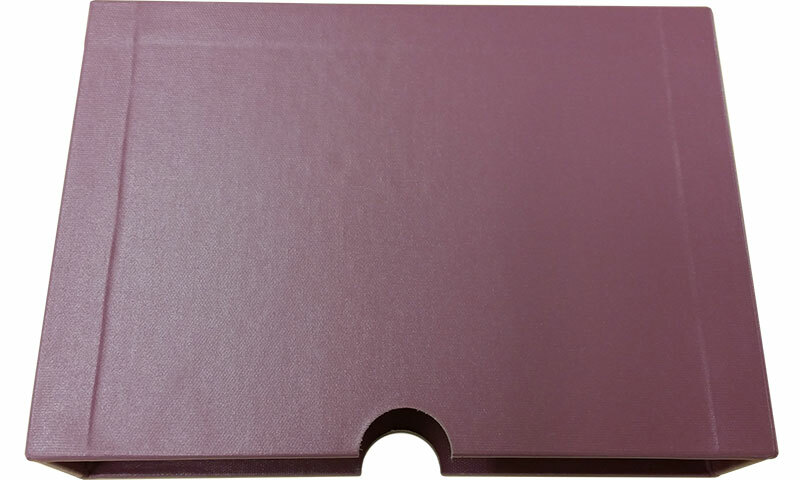 The slipcase encloses is crafted from high-density binder’s board. 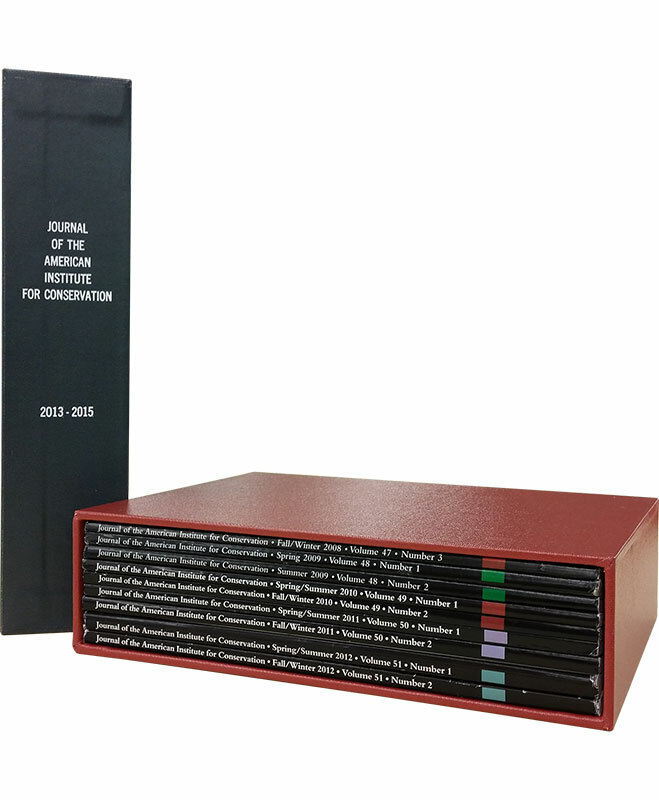 The standard slipcase is covered in durable F grade library buckram cloth, available in a variety of colors. Additional materials are available for an upcharge. View our selection. Titling is foil stamped directly onto the cloth. Minimum thickness for a slipcase is 3/8″. The trick to putting an item back into a slipcase safely is to tilt the item at a 30° angle and carefully insert the corner into the slipcase before straightening the item back up to slide it in. Every slipcase is handmade to fit each individual item perfectly. Email us the measurements or use our convenient order spreadsheet. Worried about measuring your items correctly? View our Tips on Measuring, or contact us to arrange shipment of your items to our facility so we can do the measuring for you! We use high-density, acid free binder's board to construct our enclosures. Our PVA adhesive meets library binding standards for long term stability. The slipcase is constructed of acid free board. 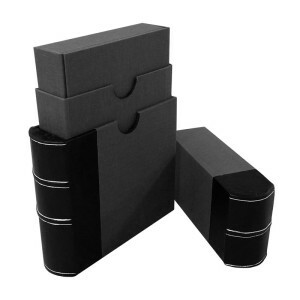 The custom fit of the slipcase helps protect items while allowing easy access and a clear view of the contents. A slipcase is an economical and beautiful way to add value to a limited edition set. Slipcases can be made to house one volume or several. 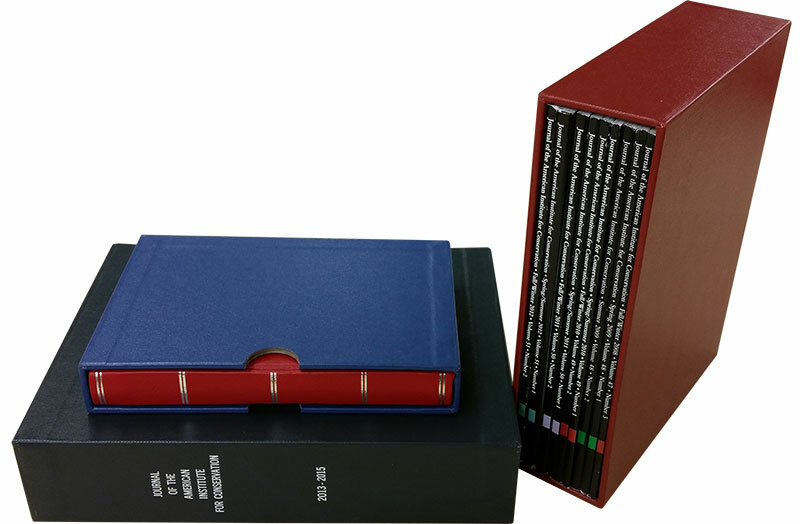 Our standard slipcase is a single slipcase, but upon request we can create a double slipcase. The double slipcase nests the interior slipcase inside an outer slipcase for additional protection. 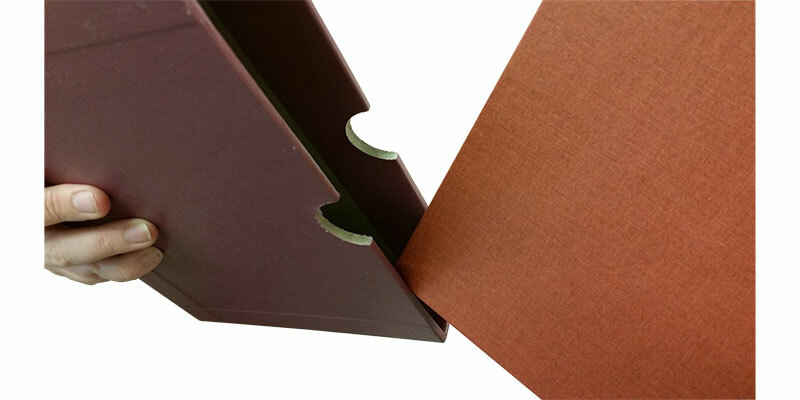 Our standard slipcase is notched on the foreedge to make retrieval of the materials within a breeze. We can omit notching at customer preference. Slipcases for items under 3/4" thick or over 5" thick cannot be notched. For a more deluxe look, consider our top loading slipcase, available with or without the pictured wrapper and rounded spine. 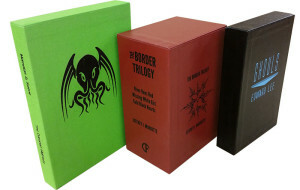 The top loading slipcase is a beautiful alternative to our standard slipcase. 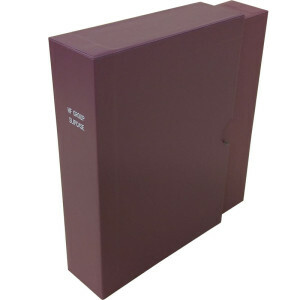 It takes up a minimum of space while providing full protection to the items within.